Scientists and geographers have provided multiple datasets and maps to document temporal changes in vegetation types and land-water relationships in coastal Louisiana. Although these maps provide useful historical information, technological limitations prevented these and other mapping efforts from providing sufficiently detailed calculations of areal changes and shifts in habitat coverage. The current analysis of habitat change draws upon these past mapping efforts but is based on an advanced, geographic information system dataset that was created by using Landsat 5 Thematic Mapper imagery and digital orthophoto quarter quadrangles. The objective of building this dataset was to more specifically define land-water relationships over time in coastal Louisiana, and it provides the most detailed analysis of vegetation shifts to date. In the current study, we have attempted to explain these vegetation shifts by interpreting them in the context of rainfall records, data from the Palmer Drought Severity Index, and salinity data. During the 23 years we analyzed, total marsh acreage decreased, with conversion of marsh to open water. Furthermore, the general trend across coastal Louisiana was a shift to increasingly fresh marsh types. Although fresh marsh remained almost the same during the 1978–88 study period, there were greater increases during the 1988–2001 study periods. Intermediate marsh followed the same pattern, whereas brackish marsh showed a reverse (decreasing) pattern. Changes in saline (saltwater) marsh were minimal. Interpreting shifts in marsh vegetation types by using climate and salinity data provides better understanding of factors influencing these changes and, therefore, can improve our ability to make predictions about future marsh loss related to vegetation changes. Results of our study indicate that precipitation fluctuations prior to vegetation surveys impacted salinities differently across the coast. For example, a wet 6 months prior to the survey may or may not have made up for a dry period during the earlier 12 months. More research is needed to better understand rainfall periods and how they affect salinity changes. The ability to understand past dynamics and to anticipate future trends in vegetation change and related land loss in the coastal region of Louisiana is a vital part of ongoing and future efforts to conserve its critical wetland ecosystem. With the loss of marsh and resultant changes in hydrology, it is likely that changes in marsh type may show greater variation in the future, even if given only minor changes in precipitation levels. 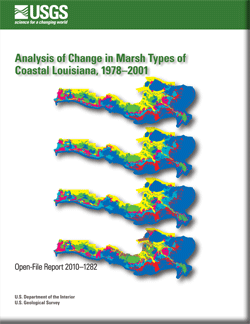 Linscombe, R.G., and Hartley, S.B., 2011, Analysis of change in marsh types of coastal Louisiana, 1978–2001: U.S. Geological Survey Open-File Report 2010-1282, 52 p.